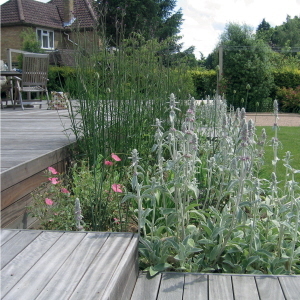 Our clients were looking for a fresh approach to their good-sized town garden. 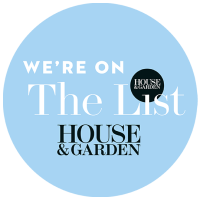 After a major extension, the garden was the next room for a makeover. The existing uneven concrete terrace was covered in hardwood warm iroko decking with wide welcoming steps leading the lawn and petangue court. This also is used as a table tennis area in the summer months. 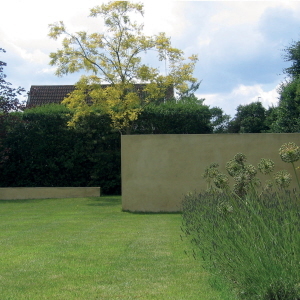 The childrens play area and vegetable garden are zoned behind freestanding rendered walls. 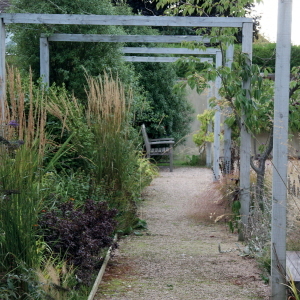 A path was created down the side of the house with a series of simple timber arches to give structural form. 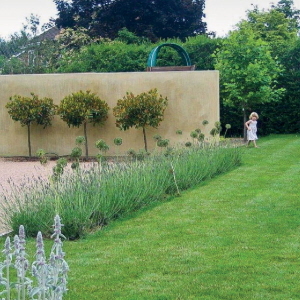 Planting is repeated in the form of evergreen standards that are up lit from below onto the rendered walls. 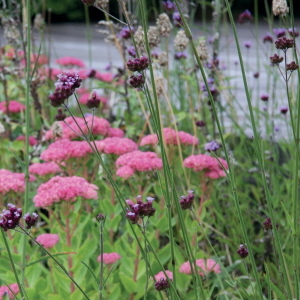 Soft perennials and grasses in a palette of pinks and mauves creates a modern prairie effect.